There is a great variety of reef types and diving & snorkeling experiences in Belize. The Barrier Reef is 185 meandering miles (298 km) of unspoiled beauty. It varies from 8 to 16 miles (13-26 km) from the mainland to less than one mile (1.6 km) offshore from Ambergris Caye. Much of it is totally unexplored and all of it is easily accessible by boat. The reef is like a gigantic wall running parallel to the coast. Between the mainland and the reef are shallow, sandy waters with numerous mangrove-covered islands (cayes). Click here (https://ambergriscaye.com/pages/town/divea.html) our underwater photo gallery. While much of the flora and fauna is similar throughout the reef system, there are individual differences to be found everywhere. A particular type of fish may be seen on almost every dive, but during mating season it may congregate in only one or two areas in great numbers. Hard corals, gorgonians, sea fans, tunicates, and shellfish of amazing variety populate Belize coastal waters, but the predominance of one in a particular stretch of reef may give that area its name. Similarly, there are areas where grouper are known to shoal, others where large stingray are prolific or where the diver may encounter a whale shark. The manta ray and spotted eagle ray are fairly common, and the diver can reasonably expect to see one of these magnificent creatures during his visit. Hammerhead shark,Caribbean reef shark and even the oceanic white tip shark are seen occasionally, but these lucky sightings are rare. Ambergris Caye is justly the most popular attraction to the tourists who come to Belize. The factor that most contributes to this is the unbelievably superb diving & snorkeling conditions. 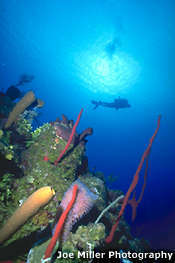 Accessibility to the dive sites, such as Lighthouse Reef, Turneffe Islands, as well as many excellent sites right off Ambergris Caye, combined with excellent weather conditions, clear warm water, the variety of dive sites and in the unlikely chance that a diving accident should occur, the hyperbaric chamber is minutes away from any of the dive sites. For general information on diving & snorkeling in Belize, click here (https://ambergriscaye.com/pages/town/diveinfo.html) . San Pedro Town has evolved from a laid back fishing village to an important tourist attraction. The pace is slow, the people are very friendly, the streets are still dirt and sand and the resorts are small and intimate. Conservation and protection of the natural resources is very important for the government and people of Belize. Proof of this is the designation of one of the most popular dive sites off Ambergris Caye, Hol Chan, a marine reserve. Strict supervision is in place and no fishing or removal of coral is permitted. Mooring buoys have been installed so that anchors may not destroy the coral. The diving immediately around Ambergris Caye is easily accessible. Divers will enjoy the shallow dives and get to see a good variety of sea life and coral. Those willing to make a larger investment in time and money can use San Pedro as a base for day trips to distant cayes and atolls, which offer some of the best diving in all of the Caribbean. Diving around the atolls is mostly wall diving, while diving around Ambergris is spur-and-groove with some deep canyons, swim throughs and reef cuts. One of the good things about Ambergris Caye, in the eyes of many, is that it does not cater only to divers. Indeed, the majority of visitors to the island now are not divers, and this means that those who don’t dive will not feel they are just extra baggage on a dive machine. Ambergris Caye offers a good mix of dive and non-dive activities. Those who wish to do nothing but dive, eat, sleep, and dive may be better off choosing a dive lodge on one of the remote atolls or a live-aboard dive boat. Among the popular dive sites around Ambergris Caye are Hol Chan Cut, Tackle Box Canyon, Punta Arena Canyons, Tres Cocos and Basil Jones Canyons. Two-tank dives around Ambergris Caye typically go for US$45 to $55, averaging US$50. One-tank dives are about US$20 less; three-tank dives about US$20 more. Rates usually include tanks, weights and belts. Other equipment is extra; US$20 is about average for a full set of gear. Those looking for even better diving likely will consider diving one of Belize’s atolls. These are Pacific-style atolls with coral islands surrounding a fairly shallow lagoon. Only four true atolls exist in the Western Hemisphere; three of them are off Belize. Belize’s three atolls are Turneffe, Lighthouse and Glover’s. Turneffe and Lighthouse are closest to Ambergris Caye and are practical day trips. For the more-serious diver, there is variety enough here to make for many weeks of diving. Visibility is terrific, often 150 feet or more. While many of the sites are best for intermediate and advanced divers, some are suitable for novice divers. From San Pedro, expect to pay about US$125 to US$185 for a day trip to Lighthouse or Turneffe, depending on the number of dives. Lunch is usually included. A typical trip to Lighthouse takes one and a half hours or a little longer each way, includes three dives, lunch and snacks and costs about US$150 per person. 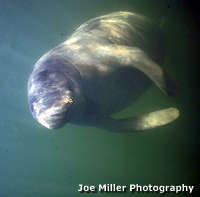 Note that sometimes dive trips are canceled if not enough divers sign up for a specific trip. The Turneffe Islands are about 20 miles east of Belize City. This is the largest atoll and the closest to the mainland. It differs somewhat from the other two atolls in that most of the islands here are densely covered in mangroves, especially on the west side. Black Beauty, Myrtle’s Turtle and Mauger Caye (north of the atoll, with a lighthouse) are among the popular dive sites here. Mauger is known for its sharks. Lighthouse Reef is about 60 miles east of Belize City. Lighthouse is home to Half Moon Caye Natural Monument, comprising about 15 square miles of atoll plus another 15 square miles of surrounding waters. Protected as a marine reserve since 1981, Lighthouse teems with birds, including a nesting colony of rare red-footed boobies. Under water life is also rich here, with dolphins and other creatures. At Lighthouse also is the Blue Hole, a limestone sinkhole several hundred feet across and more than 400 feet deep, made famous by Jacques Cousteau. Divers usually report that while the Blue Hole is worth doing once, it is more spectacular when seen from the air then from underwater. San Pedro has the country’s only hyperbaric chamber. It’s located near the airstrip. Most dive shops ask for a small donation with each tank fill which goes toward funding the chamber. ose who don’t dive but would like to, several Ambergris Caye dive shops offer courses and training. A resort course costs about US$125. This includes classroom training, practice in a pool or in the water, and an actual dive, usually at Hol Chan. Complete open water certification runs US$350 to $400 and requires four days. For those who have completed classroom instruction elsewhere, the two-day open water training is about US$200. Posted : Marty Casado - Thu, Dec 7, 2006 12:01 AM. This article has been viewed 8018 times.